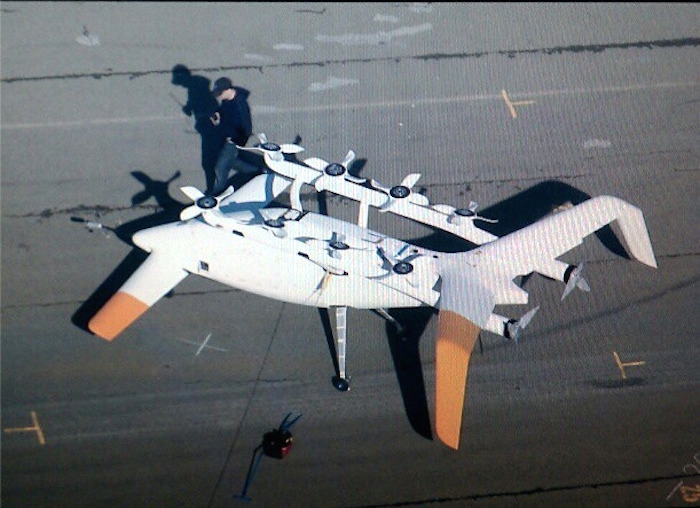 Alleged photo of a Zee.Aero prototype, via SFGate. Page is the owner of Zee.Aero, a Silicon Valley startup located next to Google's headquarters working on a small airplane that can take off and land vertically, according to Bloomberg. The project appears to be a personal investment for Page and is not funded by or directly affiliated with Google. While Zee.Aero reportedly has about 150 employees working on a flying car, Page has also reportedly funded a second, competing company working toward the same goal, named Kitty Hawk. The other startup is said to be located about a half-mile away and is run by Sebastian Thrun, who used to work for Google's X division and spearheaded its self-driving car project. The report published Thursday indicated that while a number of companies are working on mostly autonomous commuter planes, the two projects backed by Page appear to be the most fully realized visions thus far. People who have seen Zee.Aero prototypes say the airplanes are "pushers" with propellers in the back and a bulbous cockpit with room for one person up front. The company reportedly has two prototypes: One that looks like a traditional plane, while the other has six small propellers along the main body. Less is known about the designs that the Kitty Hawk team are working on, including among Zee.Aero employees, who are purposefully kept in the dark to encourage competition and innovation. It was said that Kitty Hawk's project resembles a giant quadcopter drone. Bloomberg characterized Page's investments in the two companies as a "deeply personal" endeavor for the billionaire, who hopes to change transportation considerably. Page's restless nature is well known, as he's been involved in so-called "moonshot" projects through Google and otherwise for years. In an interview back in 2014, Page contrasted himself with late Apple co-founder Steve Jobs, saying he disagreed with Jobs's highly focused approach to developing new products. "(Jobs) would always tell me, 'You're doing too much stuff.' I'd be like, 'You're not doing enough stuff,'" Page said. He added that it "seems like a crime" to earn billions of dollars and not invest it in things that could make people's lives better. While many of Google's forward thinking projects, including its self-driving car technology, are publicly known, Apple keeps its research and development efforts tightly sealed behind closed doors. There has never been an indication Apple has worked on or is currently pursuing any ambitious "moonshot" projects within its labs.